The stripes are invisible because even though they are no longer in jail, they will never be free. 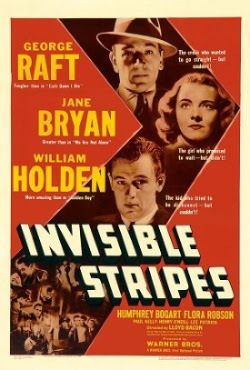 Invisible Stripes (1939) watches a lot like another Bogie movie that came out that same year: Roaring Twenties (1939). Instead of James Cagney and Bogie coming home from World War I you have George Raft and Bogie coming out of jail. The plight they face when they come home is the same. Any opportunities that were available before the left are not there when they come back. Bogie, in both roles, knows that going/staying bad is the only way to get by whereas both Cagney and Raft make a valiant effort at going straight. George Raft plays Cliff who tries everything he can to get a decent job but finds nothing but opposition. No one wants to have an ex-con from Sing Sing on staff. His little brother Tim (William Holden - wait, what? William Holden? OMG! That was him? I didn't even recognize him. He's so young. Why didn't anyone tell me...) wants to marry his longtime girlfriend Peggy (Jane Bryan) but he can't make ends meet enough to be able support a wife and a family. Tim is very tempted by the criminal life that people like Chuck (Bogie) lead; taking what they want, when they want and making no excuses. Cliff will do everything possible to give his little brother and his mother (Flora Robson) a good life, even if it means sacrificing a life for himself. Bogie is as well represented here as he was in Roaring Twenties. He's in a supporting role, has fourth billing but his part is significant enough that although another actor carries the movie you still get the Bogie experience. i havent seen this one in a long long but i do remember it being a solid picture and moved right along, just nothing really outstanding about it. yeah William Holden is REALLY young in it huh? i'm really enjoying these posts Quelle, as if you cant tell! hey that rhymes :) i shoulda been a rapper. I have never seen this Bogart film and what a surprise that it also stars William Holden! This makes me want to go put this movie on just to see that acting combo.